When fans of Patrick Stewart think of the actor, they likely don't callback to mind characters who partake in habitual drug use. They also probably don't think about the actor being all that funny either. Well, if he and the folks involved in his upcoming series Blunt Talk have it their way, both of those things may change. See for yourself, in the below teaser for the series and try to picture Stewart doing lines of cocaine. I dare you. We're thinking the occasional bump vs. the “face full of cocaine” is a safe bet. All powdery substance aside, the short clip has us intrigued. Blunt Talk is a live action character-driven comedy set in the world of competitive cable news. The plot follows title character Walter Blunt (Stewart), a strange British television personality who has now set his sights on conquering the world of American cable news. With sharp focus, he plans to help Americans by sharing with them his “wisdom and guidance” to better their behavior and ultimately their lives. Surrounded by an incredibly dysfunctional news staff, network bosses, a handful of ex-wives and a number of children, he relies upon the support of his only ally, an “alcoholic manservant” whom he plucked from the UK to join him in Los Angeles. 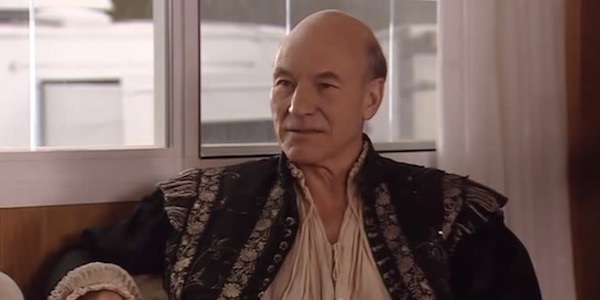 While most fans know Patrick Stewart as Charles Xavier/Professor X from the X-Men series and/or Jean-Luc Picard from Star Trek, many probably aren't aware of his most-hilarious comedic sensibilities. With Blunt Talk's above premise and teaser, I can't help but draw comparisons to his cameo appearance in Ricky Gervais' Extras. While there are no drugs involved in his storyline from the show, his subtle wit and hilarious line delivery (like "I've seen everything"), could certainly give us an indicator as to what to expect comedically from Walter Blunt. MacFarlane and Stewart go way back with the actor doing voice-work for American Dad!, A Million Ways to Die in the West, Family Guy, Cosmos: A SpaceTime Odyssey and Ted. It looks like he may not be returning as narrator for the upcoming Ted 2, which stars Mark Wahlberg, Morgan Freeman, Amanda Seyfried and Liam Neeson, but Blunt Talk offers him a much more interesting opportunity anyhow. We're looking forward to seeing it play out. Blunt Talk co-stars Jacki Weaver, Adrian Scarborough and Dolly Wells and is set to premiere this summer on STARZ.